Thanks to its three polar patterns, its unique -10dB cut and +10dB boost function and its striking design, SontronicsORPHEUS is a must-have for practically any studio or live application… and many users call it the best room mic they've ever heard! The ORPHEUS boasts extremely low self-noise and this coupled with its unmistakable presence and defined clarity, especially in the higher frequencies, allows you to record the subtlest of instruments or voices without the need to edit afterwards. "ORPHEUS has such great bite without losing any clarity or detail. It's become a real go-to mic for anything and everything, from vocals to snare drum, acoustic guitar to autoharp, piano or incredible room ambience"
A lot of time and effort was spent honing the ORPHEUS body as well as its capsule and electronics, to ensure that the resulting mic could be hugely flexible for studio work as well as live recording. Its highly sensitive 35mm dual-diaphragm capsule is suspended in its own special mount, almost floating in that large, spherical basket, which itself allows ORPHEUS to soak up every detail of the space it's recording in. ORPHEUS's body is cast from zinc alloy, which gives a very low resonance, helping to keep the signal tight and accurate. "I'm constantly excited by the results I get from my Orpheus. 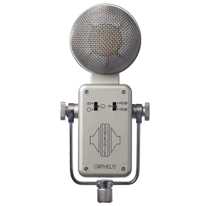 It's sounds so full bodied with excellent presence on vocals, drum overhead or as a room mic"
Since ORPHEUS was introduced (it formed part of Sontronics' initial range of mics for our launch back in 2005), it has become a favourite with live sound engineers for drum overheads (when used in pairs) and has also become extremely popular in the voiceover community, thanks to the fact that it delivers crisp, classy results on male and female spoken word. The three polar patterns also mean that ORPHEUS is fantastically versatile when it comes to recording groups and ensembles (in omni mode), for use in mid-side and other experimental applications (in figure-of-eight mode) or even for foley and sound effects work. British broadcast-quality mic to be proud of!" Sontronics ORPHEUS is supplied in a luxury, velvet-lined wooden box and comes with a special angled mount adaptor, to give you plenty of flexibility whether you're using it on stage, in a vocal booth or in the studio. Like all our mics, ORPHEUS is protected by our LIFETIME WARRANTY. ORPHEUS really does need to be heard to be believed, so if you'd like to organise a demo, either contact your nearest distributor or dealer, or get in touch with us directly, so we can set something up for you. We guarantee you'll never hear the same way again!